Canadians are faced with persistent social and environmental challenges that require cost-effective solutions. Our future ability to meet growing needs in education, healthcare, energy, climate change, and the inclusion of vulnerable populations such as seniors, people with disabilities and new Canadians, requires an integrated approach to link and unlock economic and social value. 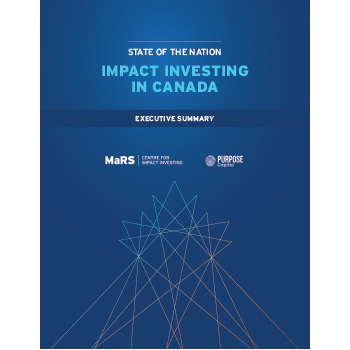 The State of the Nation report responds to a need to better understand the nature of impact investing activity in Canada, the ways in which it is evolving and maturing and the areas in which it could grow or falter. If you are an investor or financial advisor, this report will help you understand what impact investing is and where it is most active across 10 impact sectors. If you are a business or social entrepreneur, this report will provide you with examples of investments that have enabled entrepreneurs to open, operate or expand their businesses or initiatives. For those advancing public and institutional policy, this report will provide a snapshot of recent activities to enhance a supportive regulatory environment. The report is available in English and French versions.